Adventures In Uglyworld: Uglyworld #463 - How Many Currents Does This One Have? Uglyworld #463 - How Many Currents Does This One Have? Uglyworld #463 - How Many Currents Does This One Have?, originally uploaded by www.bazpics.com. 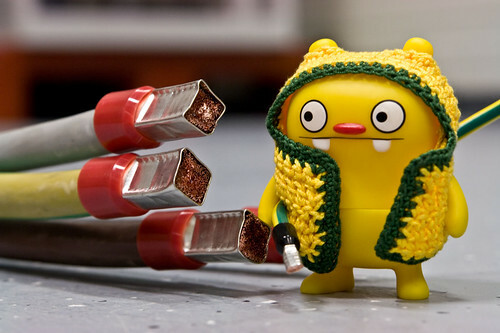 Have you ever in your wildest dreams thought of how you would teach the theory of electricity to an Uglydoll? It certainly wasn't something that had ever crossed my mind before tonight when Jeero came to work with me, but he was so into everything that I was doing that when he offered to help out we found him something to do. First off he sorted out all of the different parts which had arrived during dayshift for the machine we're building and then after that we decided to let him help us prepare some cables. This is where I should have known better, in hindsight I should have said to pull a specific cable from a specific place without any deviation or avenue for Jeero to think for himself, oh no, that's what I SHOULD have done! Instead I told Jeero I needed a few metres of cable to make a little earth strap, and after tonights earlier talk about how voltage and current work in an electrical circuit he knew that currents even though they can be tasty when served in a hot cross bun, can also be deadly. He also applied his own knowledge of more and bigger is always better, so when he already had the right size of cable in his hand and was walking back to us - had he not noticed the huge cable beside him everything would have been A-OK. But nope, it wouldn't be Jeero if things were that simple - so instead the little guy took the best part of the next 2 hours to try and pull the HUGE cable over to us, this thing is BIG and no matter how hard he pulled he couldn't even make it budge. When he finally gave up and came over to tell us that he found us the perfect cable we couldn't stop laughing at him when he said that "as this one is biggers it's mores full of tasty currents, isn't it?". Uglyworld #439 - What Times Do You Calls This?